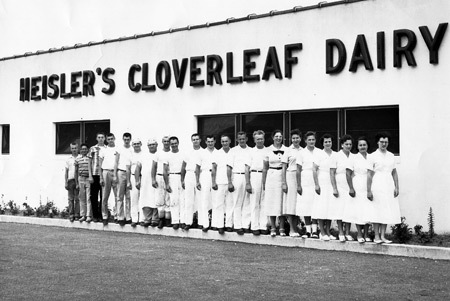 Heisler's Cloverleaf Dairy was founded in 1924 by Morris Heisler who began as a small milk producer. He started home milk delivery door to door selling milk out of milk can by the ladle full. His operation grew from there. The business quickly became one of the area's leading milk suppliers. In 1957 he decided to start making ice cream. He opened the dairy bar in 1957 to rave reviews. All the ice cream was made here on the premises using only quality ingredients. Shortly after the dairy bar became a success a miniature golf course was added. The builder was Holmes Cook, who built and operated miniature golf courses up and down the east coast including Coney Island in New York. Soon the Waffle Shop, Driving Range, Gift Shop and Arcade would follow. Heisler's Dairy continues to operate today under the direction of Morris' nephew, Leonard Ostergaard and his wife Ann. Their philosophy has stayed the same for over 50 years. Give people a quality product and a decent price with a friendly smile. Generations of families have enjoyed Heisler's, a day in the country — the simple part of life. 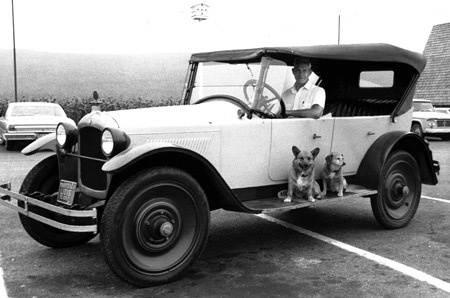 Our founder, Morris Heisler, in his famous antique cars with beloved corgis. 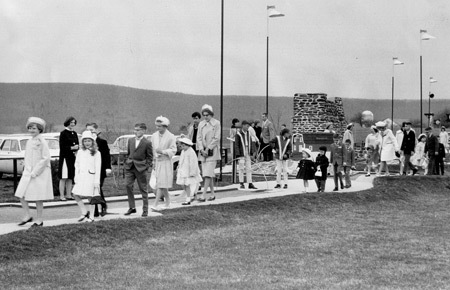 Easter Parade on the original miniature golf course. The was a yearly event through the 60’s & 70’s. 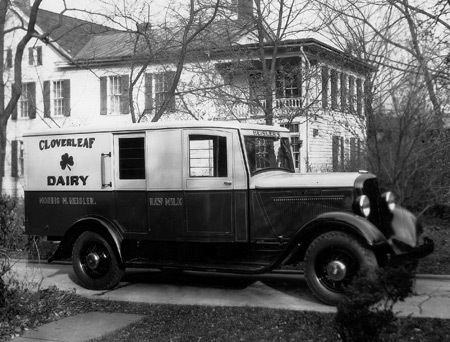 One of the original milk delivery trucks. The originals were actually horse and buggy. The original dairy bar after we first opened. 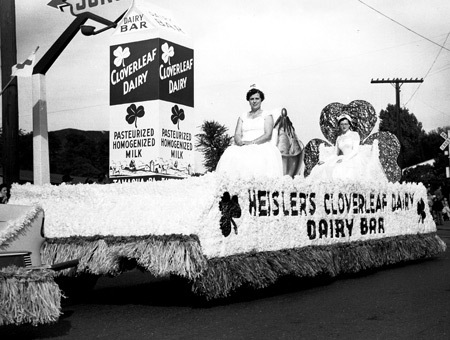 Floats were often seen in area parades. The milk carton seen in this picture still is around the farm. It was displayed for our 50 year celebration in 2007. 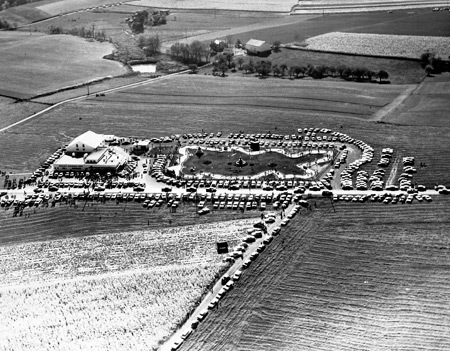 Arial view from the mid 60’s. Note the crowd even then. 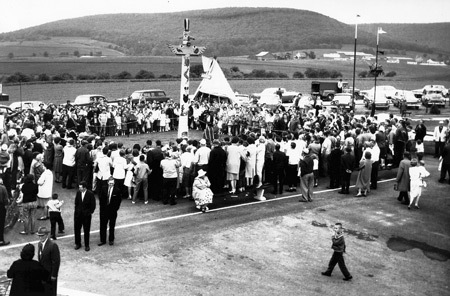 Dedication of the totem pole. It was an actual Indian Ceremony. 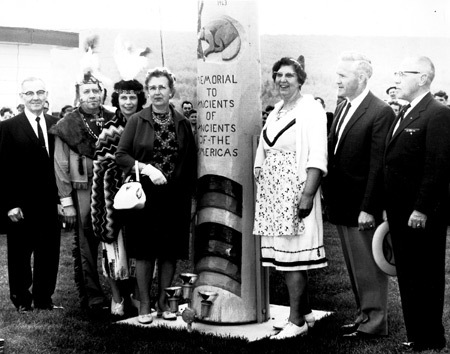 Morris and Pearl Heisler at the dedication. 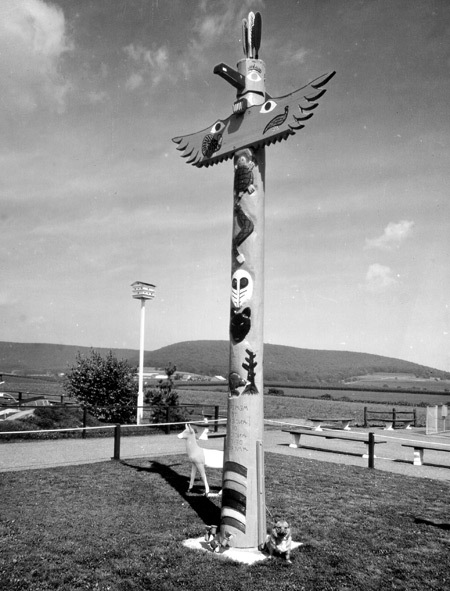 The totem pole still stands in the original place today. 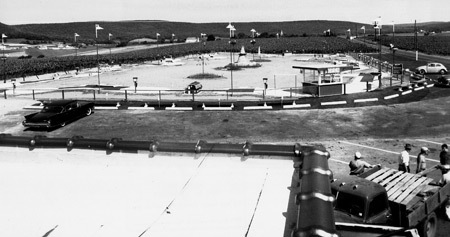 The original Holmes Cook miniature golf course. It was taken out in 2003 renovation project. Gone but not forgotten.